My grandmother was a nurse. She's retired now, but I remember how she used to chastise her grandchildren, scolding us about washing our hands, eating certain foods, and getting exercise. Above all, she was straightforward about our bodies. When we were too shy to put on our swimsuits in the changing room at the pool, she used to say, "We all got the same thing you got.” Another time she scolded me for cringing at a violent scene in a crime show, "Well, we all have to go sometime, sweetheart." Because of her, I have always associated nurses with a sort of grandmotherly sass and frankness about the human body. 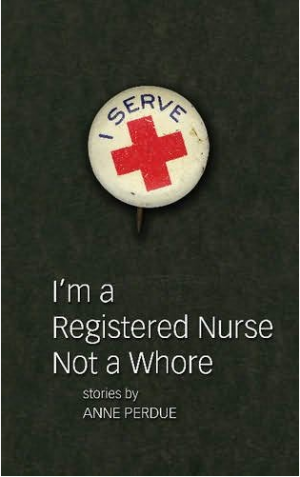 This immediately came to mind when I picked up Anne Perdue's I'm a Registered Nurse, Not a Whore and I can honestly say I was not disappointed by the book. With episodes ranging from dental self-surgery to an accident involving a vat of wax, Perdue's plots often revolve around physical crisis. Her stories are not for the squeamish. Perdue uses unhesitating honesty for her descriptions of people and their bodies, offering up characters that are flawed and deeply compelling. The result is a collection that shows us the painful—and often darkly funny—conflicts of friendship, marriage, and parenthood. Perdue's stories typically begin by introducing us to a common scenario: a couple on vacation or a family at dinner, but then she shows us how the character’s smoldering inner desires and regrets build up into a violent climax. In "Inheritance," a Botox-injected car salesman fantasizes about his youthful dreams of becoming a musician while building a deck for his house. As he’s working his children torment and disobey him, but we are privy to his inner thoughts. The story culminates in a relative's fall, a lost tooth, and a backyard grill tragedy. "Inheritance" introduces two of Purdue's common themes; one is regret. Characters in I'm a Registered Nurse, Not a Whore lament a youth subculture ("Theories of Relativity"), bad marriages ("CA-NA-DA," "Inheritance"), and failed careers in musical theater ("The Dry Well"). The other common theme is parenthood. There are some sympathetic parent-child relationships in these stories, but parenthood in I'm a Registered Nurse is often more painful than it is fulfilling: Children are distant and unappreciative, defying their parents' efforts at reconciliation. Perdue's prose is crisp and direct, presenting fresh ways to describe our physical selves ("Bodies aren't a whole lot different from houses. They're made of matter and they crack and tear and sometimes things grow in them that shouldn't") and reinventing old clichés ("If we are what we eat, Leona was oxidized, fused to the vegetable crisper, ripe for fruit flies"). She writes engaging dialogue, transferring from one character's head to another with a sometimes absorbing and sometimes vertigo-inducing speed. Perdue is at her best when she stays with one or two characters throughout a story, as in my favorite piece from this collection, "Pooey." "Pooey" follows the relationship between Jackie, a single woman pursuing artificial insemination, and her sick and aging mother, Leona. "Pooey" masterfully blends pathos and dark humor—you cringe as Leona takes a drunken fall on her seventieth birthday, as Jackie falls over the punch bowl at a bridal shower—but you root for these women all the way. In "The Dry Well," the marriage between new homeowners Heather and Keith slowly unravels as the house around them floods and falls apart. The story transitions between Heather’s and Keith's thoughts, using crawling mice, leaking roofs, and sinister repairmen as the backdrop for the story. At times I wanted to know more about the victims of the violent outbursts in these stories, about the world after the catastrophe. Perdue's structure can feel a bit redundant—near the end of I'm a Registered Nurse, Not a Whore I found myself patiently waiting for the fire, the fistfight, or the flood that would come and sweep the story away. But these stories also give us splendid moments of release, moments where the passion of inner life mirrors the explosive and painful physical action of the stories. Perdue's stories are edgy and fresh, providing just the right dose of sympathy and satire.